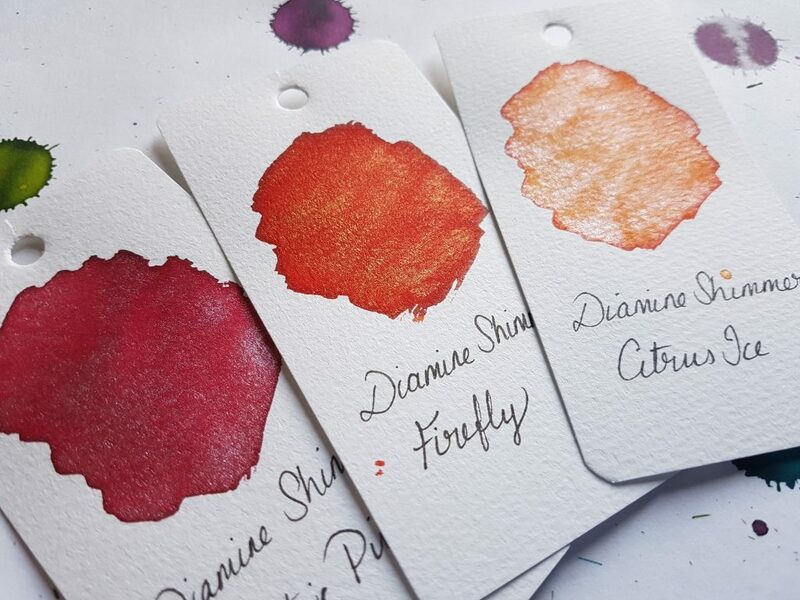 The Diamine Shimmertastic inks range has recently been expanded with some new colours. 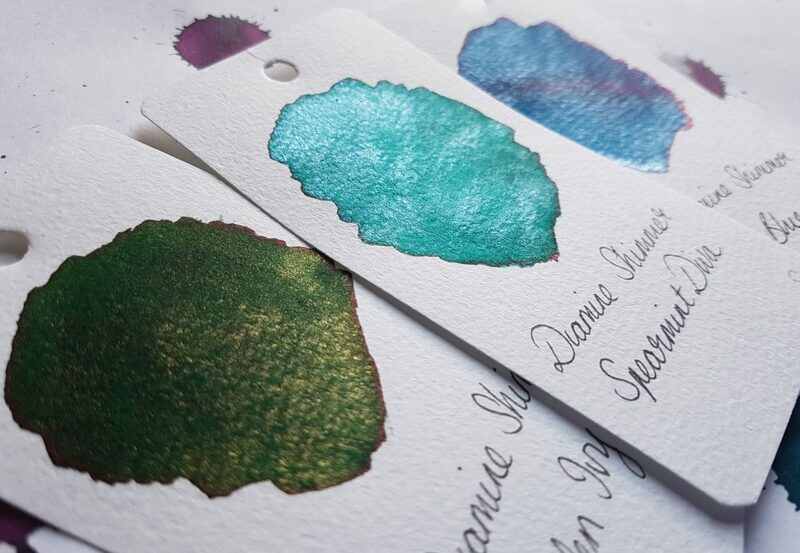 As the marketplace for shimmer inks gets busier, these 8 new colours are a welcome addition. These are more unusual colours and shimmer pairings which, I think, will prove popular. 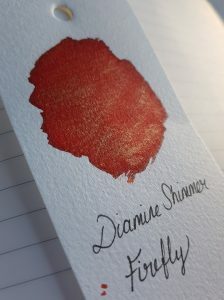 Diamine kindly sent United Inkdom members samples of the new range to try out. Here’s my verdict in (approximately) spectrum order. 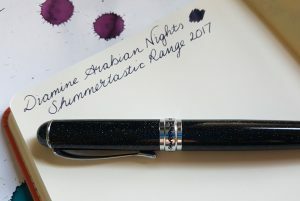 This is a particularly nice ink and a great addition to the Diamine Shimmertastic range. The base ink colour is a dark purple-black with blue tones. The shimmer is silver (it looks bluish to me but that might be a reflection of the ink itself). This is the sort of ink that is practical as well as a little flashy. I’ve been using it in a Jinhao x750 and am enjoying the results. On the page, the ink is lovely. It’s nice and dark but with lots of character, and the shimmer works perfectly. Even in the fine nib of the Jinhao, the shimmer is set down evenly. Clogging is a perennial fear in some quarters with shimmering inks. With these one from Diamine, I have found that if I leave the ink in the pen for several days without using it, I get hard starts. However, a few moments of work will get it going again. I’ve not experienced anything that could reasonably be called clogging. 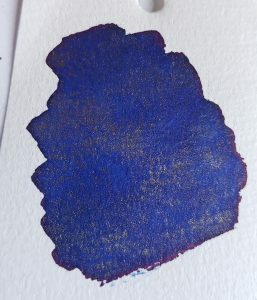 This is a lovely, cheerful cobalt blue with a slight red sheen visible at the edges. The shimmer is golden which works perfectly. 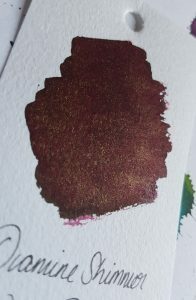 I was really impressed with the colour of this ink, and would be tempted to get some even if it didn’t have the shimmer. 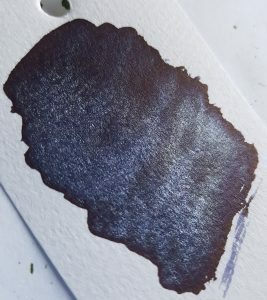 It’s similar to Diamine Majestic Blue, but the latter is a little darker. The red sheen, which I hope is visible in the photo, is subtle but wonderful. 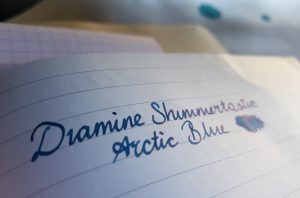 The Arctic Blue swab was the single most impressive of the Shimmertastic inks. 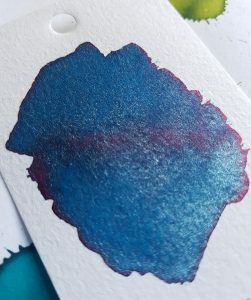 This ink is a cooler-toned blue than Cobalt Jazz, with a more pronounced red sheen. As you can see, the sheen showed not only at the edges but across the middle of the swab. The shimmer is silver. I’ve been using this ink in a Lamy Al-Star with a 1.1 stub nib. Again, it caused a few hard starts if left for several days, but no clogging. The 1.1 nib helped to show off the sheen and shimmer of this ink. It’s definitely one which benefits from a nib that puts down a lot of ink. 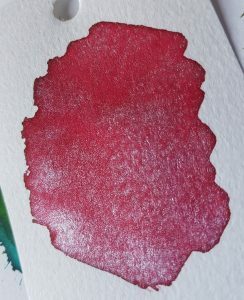 When writing, some papers show up the red sheen particularly well (Tomoe River paper being the obvious candidate). Spearmint Diva is a bright blue-green with silver sparkle. There’s a slight hint of dark red sheen at the edges too. 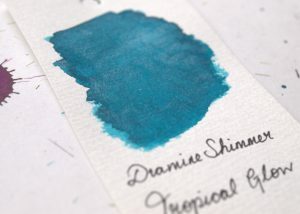 It’s similar to another Diamine Shimmertastic: Tropical Glow. Spearmint Diva is more green than that though. 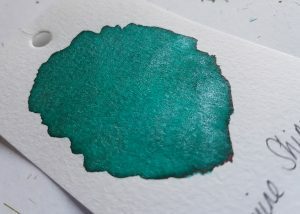 It’s also similar to Diamine Marine, one of my favourite inks, though the latter does not have shimmer or any sheen. It’s no secret that I’m a big fan of these blue-greens, teals, and peacock colours. Spearmint Diva is no exception. 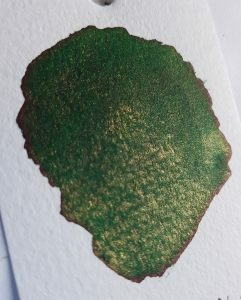 This is a rich green ink with gold shimmer. 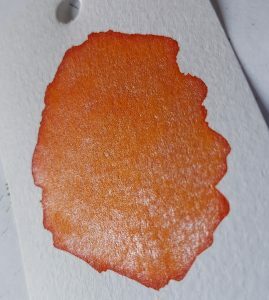 Again, this ink has some sheen visible at the edges of the swab. I haven’t found that it shows up when writing, even with Tomoe River paper, but others may have more luck. 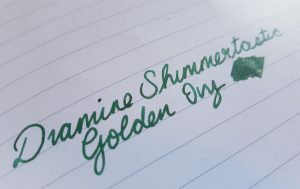 Diamine Shimmertastic range has another green ink with gold shimmer, Golden Oasis, but the new Golden Ivy is a darker ink. 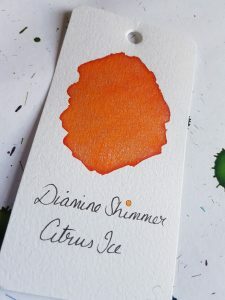 Citrus Ice is a gorgeous, warm orange with silver shimmer. The combination of orange in silver is unexpectedly pretty. Firefly is just gorgeous! It’s a saturated red with gold shimmer. It’s warm and rich, very slightly orange-toned. Wine Divine is another lovely colour. It’s a dark, wine red (as you might expect) with gold shimmer. The ink itself is a lovely warm burgundy colour. 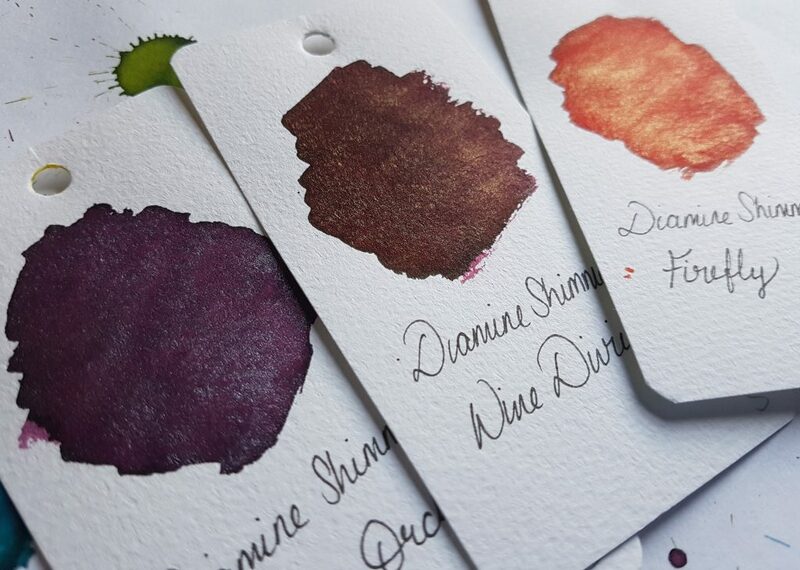 Diamine already do a mean range of wine-coloured inks. My current favourite is Syrah, but there’s also Claret and Merlot. Wine Divine is a great addition to that cellar. Pink is a colour you either love or you hate, it seems. I’m not fond. That said, this is probably the most tolerable pink ink I’ve seen. It’s a strong, saturated colour that’s on its way to red. The silver sparkle in it works well. 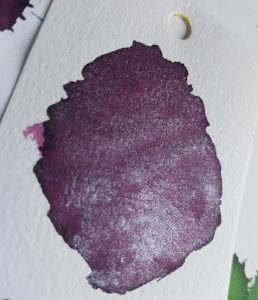 This is a lovely red-toned purple ink. It’s darker than I expected with a name like “orchid” but that might just be me! The silver shimmer definitely gives it a “frosted” look. The contrast of the warm ink colour and cool shimmer (as with some of the other Diamine Shimmertastic inks) works really well. I can imagine this would be a popular festive ink for those wanting to avoid red, green, and gold. 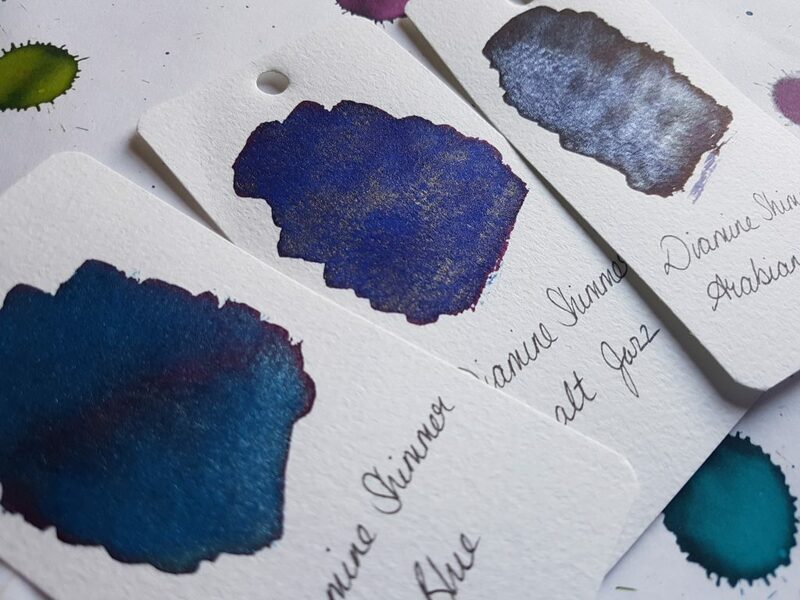 Overall, these inks offer genuinely interesting additions to the Diamine Shimmertastic inks range. The variety and interesting sheening properties, combined with great value for money (a 50ml bottle costs £8.95), makes these a really good option for adding some sparkle to your writing.